LAMAVE has been studying whale sharks in the Philippines since 2012. We started working with this species to understand the human-shark interactions, and how these can be beneficial to local communities as well as for the species. However, human-shark interactions can have ecosystem-level implications which need addressing in order to ensure their long-term sustainability. We are now working across the different tourism sites in the country, namely Donsol, Oslob, Southern Leyte and Palawan. Whale sharks were targeted by fisheries in the Philippines into the late 1990s, after which time the species was nationally protected. Their populations have however declined globally, leading to their up-listing to 'Endangered' under the IUCN Red List in 2016. As part of our ecological understanding of the species, we also study their movement patterns and distribution, and how these sites link up between them. Our main research technique to understand their ecology is photographic identification (photo-ID). 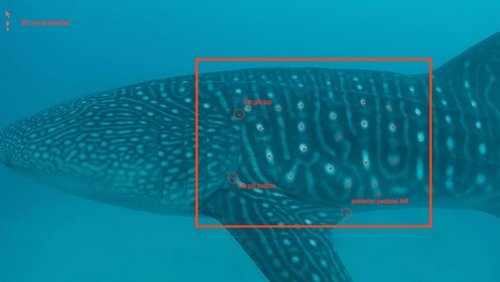 This techniques harnesses the uniqueness of the whale shark's spot pattern and through the aid of star-mapping software, we can 'match' whale sharks between areas. We have now employed this techniques across 5 sites in the country, which gives us a good idea of their movements. Our understanding can be complemented by the general public, who can also engage in collecting photo-ID data through citizen science. Another research technique we've employed to understand whale shark movements is through the use of satellite tags. In 2015 we partnered with Marine Megafauna Foundation (MMF) and Tubbataha Management Office to tag whale sharks at Tubbataha Reefs Natural Park, with the aim of understanding their movement patterns in the country, but also how they might be using areas that still pose a risk for this endangered species. Satellite tags can tell us a lot about how whale sharks use specific areas, and how they might travel long distances between important foraging grounds. These data are essential to sustainably manage the species and their habitats. In July 2016, the IUCN Red List announced that the whale shark was no longer listed as vulnerable but rather endangered, thus sliding closer towards extinction. HOW MANY WHALE SHARKS ARE THERE IN THE PHILIPPINES? In 2016, the 1000th whale shark was identified in Philippine waters, making the Philippines the third largest known aggregation of whale sharks in the world and the biggest in South East Asia, according to the online library Wildbook for whale sharks. The video opposite explains more and tells you how you can contribute to whale shark conservation. Donsol Bay is home to the Philippines' original whale shark tourism destination, which was founded in 1998 with the assistance of WWF-Philippines. Whale sharks naturally aggregate here to feed in the rich waters. In 2015, LAMAVE started working with WWF-Philippines to study this aggregation and to build a comprehensive database of individual whale sharks using photo-ID. The waters of Donsol, in the Southern tip of the Bicol region, have been home to whale sharks for many years, though it wasn’t until 1998 that people realised its potential for tourism after new legislation (FAO 193) was passed, protecting whale sharks across the country. Shortly after the passing of the law, WWF-Philippines worked alongside the local government, Department of Tourism and stakeholders, to set up effective and sustainable tourism practices. The area soon became known as the “Whale Shark Capitol of the World” and remains the Philippines original whale shark tourism destination. WWF Philippines collected extensive data on the whale sharks since 2007, and in March 2015 began a collaboration with LAMAVE in order to continue the collection of whale shark photo-ID to identify and follow population trends in Donsol. Using this data, the team is building a comprehensive database of individual whale sharks using photo-ID. This, in combination with LAMAVEs work in Cebu, Palawan, Southern Leyte and Mindanao, is essential to developing an understanding of whale shark movement patterns in the Philippines and beyond. The whale shark project in Oslob, Cebu involves researching the resident population of whale sharks, monitoring the impacts of provisioning on the animals, and studying the socioeconomic implications of this tourism industry. This is LAMAVE’s longest and largest running project. The quiet seaside town of Oslob gained international publicity after the local government approved the feeding of whale sharks in the fishing Barangay of Tan-Awan in 2012. What began as a small tourist operation, has skyrocketed into a booming industry that continues to grow, mostly unregulated. While the activities in Oslob have resulted in a large boost to the local economy, they raise ongoing conservation and sustainability concerns. LAMAVE identified this region as an important source of insight into the long-term ecological and behavioral effects of tourism on these animals, and also on the socio-economic impacts on the local community. In 2012, we set up a research base and began monitoring whale sharks in Oslob through daily photo identification and behavioral surveys. We also deployed multiple temperature-depth-recorder tags on local whale sharks to understand their local habitat use and diving behaviour. In 2014, the teams' first scientific paper was published describing the Population structure and residency patterns of whale sharks visiting Oslob. Another scientific paper followed in 2015 outlining the findings of a three year study investigating whale shark behaviour and tourist compliance to the local code of conduct. The study highlighted that some local guidelines were being broken 97% of the time, highlighting an urgent need for improvement in the management of the tourism practice. LAMAVE continues to work with the Local Government Unit. Read more about how this project contributes to our nation wide whale shark research here.